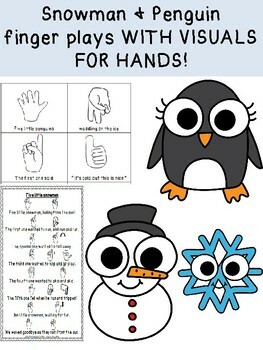 UNIQUE FINGER PLAYS with VISUALS for 5 little penguins and 5 little snowmen! Do you want UNIQUE finger plays that includes VISUALS for what CHILDREN SHOULD BE DOING WITH THEIR FINGERS? 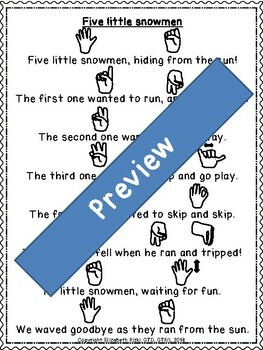 This includes two original finger plays (5 little penguins and 5 little snowmen). This includes the overall play with visuals for hands (page 3 and page 7), and then cards for each motion (pages 4 -6 and 8-10). 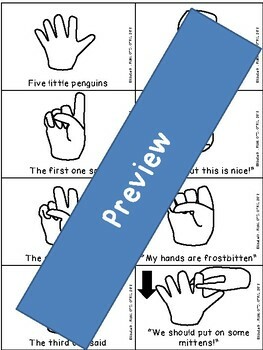 These cards can be used by holding up each card so students can see each card. I love doing finger plays with the little ones but find it hard when there are no visuals for what hands should be doing. This is a great reminder for staff and students. This also great for students who need extra help. This is NOT intended to replace medical advice, or to treat or diagnose. This should only be used appropriately within your practice law and services. If you are unsure, stop activity immediately and do not recommend anything. This is perfect to help guide discussions with teachers, staff and other personnel who work with students. This is perfect for general education students but also students with Autism spectrum disorder, ADHD, ADD, sensory processing disorder, and other special needs. This can be used with general education, RTI, MTSS, special education, school psychologist, school counselor, occupational therapy OT, speech language pathology SLP, and social work SW. I am a school occupational therapist who has a doctorate in occupational therapy. I work closely with special education and general education staff adapting material. This is where I get my inspiration for this material. I have used my materials with a variety of children with different disabilities including learning disabilities, dyslexia, autism, sensory processing disorder, ADD, ADHD, visual impairments, deaf/hard of hearing, cerebral palsy, down syndrome and more. DISCLAIMER: By using this, you agree that this activity is not intended to replace the advice of a physician or occupational therapist. Information provided should not be used for diagnostic or training purposes. Please speak with your physician or OT if you have questions. Stop any activity if you are unsure about a child’s reaction or ability. You should discontinue anything if you do not know your child’s reaction or ability.